James Clavell was an Australian author of epic, sweeping historical fiction. Following the critical and financial success of the miniseries Roots in 1977, Hollywood went on the hunt for another work of suitable size to use as a basis for another miniseries. They landed on Shogun, Clavell's third novel, and created an adaptation that was reasonably faithful to the book, given the typical relationship between books and movies. That miniseries, another titanic success, introduced Toshiro Mifune to mainstream American audiences, and made major stars of Richard Chamberlain and John Rhys-Davies. His second novel, Tai-Pan, was made into a movie that was unfortunately filmed in China, which meant that the production team was constantly at odds with the Chinese government, who basically wanted a propaganda film. It did poorly with critics and movie-goers, and adversely affected Clavell's efforts to get his rights back and produce it as another miniseries, which was tragic, because Tai-Pan was right up there with Shogun in terms of scale, and would have made a fabulous miniseries. But there was a game. 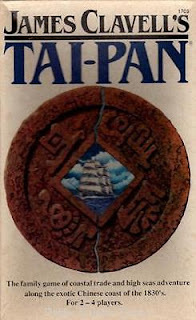 Produced by FASA in 1981, James Clavell's Tai-Pan is, reduced to its simplest terms, is a representation of the clipper races of the 19th century, as captains vie to load their goods in China, and be the first one back to England. The first one back gets the best prices for his goods (tea, silk, and spices, oh, and opium), so it's an advantage to leave early, but at the same time, staying longer to load up can be advantageous as well. If this was all there was to it, it would be a simple roll the dice and move your pawn racing game, but of course, it isn't. Much skullduggery went on in the book, and one of the underlying themes was the concept of "joss," a Chinese term denoting fate, luck, God, and the devil all rolled into one. Each turn, the player draws a Fate card, which must be skillfully integrated into the rest of his or her strategy. Some help, some hurt. There are disasters such as war and typhoons, pirates, unexpected price fluctuations, and others that allow the tongs to call in "favors" from your opponents, or that obligate you to perform them. Sometimes your hard-earned cargo spoils. Sometimes your warehouse catches fire. Joss. It's a fabulous game that we found incredibly enjoyable. The picture to the right is of the starting setup. The clippers have just arrived in Canton and offloaded the opium they shipped in India, having been moved down from Afghanistan, no doubt. The cargoes have been loaded on the clippers for the race back to England, and now it's up to the Houses to turn that opium into silver, and the silver into more cargo before the clippers return for another load. Once you get into the game, it is ever so much about the "joss." The tiny cards at the top edge of the board are the Fate cards, and each turn, each player takes one to keep or use later. A few must be played the instant they appear, and we have had lorcha, or "junk" losses to typhoons, ports quarantined with malaria and Asian distemper, and have sabotaged each other's cargoes and ships, set the triads on each other, and manipulated the goods markets in England. My daughter and I have really gotten into the spirit of the book, blasting each other with underhanded vendettas, and even starting a war to place the other in the line of fire. Meanwhile, wifey sits quietly, raking in the bread, with a "ho-hum, not me" expression of innocence that oddly enough seems to be working; not that she hasn't experienced some collateral damage, though. But staying out of the furball seems to be working for her. The big problem with this game, like so many from the heyday of the wargame era, is that it is too long to be played in any reasonable time. We started just before noon, and at about 5:00, daugher-in-law showed up with three of the grandkids, and we're "taking a break." Yeah, that's what we're doing. As of this break, I'm slightly behind, daughter is slightly ahead, no one is dominant nor out of it, and we aren't halfway finished. When the last Fate card is drawn, the discards are reshuffled including a new card that says "British Parliament Ends the Opium Trade." When that card is drawn, the game ends at the end of the next clipper race, and that card may not come up until the end of the next deck. We have all had great fun managing our purchases and playing hob with each other's plans, and we're talking about finishing tomorrow, but I'm wondering whether we're really going to invest another day in this. It's too bad, because this is a very enjoyable game. It just doesn't lend itself to today's multi-tasking, instant entertainment world. To the left is the current position, and while the clippers are out on the race route, it's hard to see that anything else is different. In any case, a good time was had by all. The thing we're going to have to think long and hard about is whether we're going to play this again. This would be a good game for a club or a tournament, people who routinely spend long hours over multiple days on their hobby, and it does a fine job of channeling the events of the book. Bottom line, we may or may not come back to finish this, but we've had a ball playing it so far. There are just too many things going on in our lives that we don't want to ignore for this length of time. How about you? Do you have one of these "guilty pleasures" that makes its demands on you? We'd love to hear about it. Well, gotta go visit with the young-uns. Until next time, get out there and live life like you mean it! I want to introduce you to a friend of mine, Richard Schulte. Richard is best-known, and he is known, for his work as a photographer, and thousands of his elegant photos grace the pages of his photoblog, Cool San Diego Sights. But there is another side to Richard, one that he doesn't publicize, one that he just pursues out of love, and doesn't seem to much care who sees it. Well, I care. Richard writes little slice-of-life stories... No, not stories, vignettes, a glimpse of something fleeting, something haunting, an event passed on the road that you'd like to know more about, but you never will. You just have to fill in the lead-up and the aftermath yourself. And make no mistake, you will. Happy, tragic, storybook, or sad, your mind will demand closure, and will eventually provide it. Here is today's example, a story called Elvis and the Time Machine. You’ve probably seen Elvis–with that ridiculous hair, upturned collar and sequined jumpsuit–riding his Time Machine up and down Main Street every single day. I’m not sure where in town the guy lives. But he’s out there riding the Time Machine up and down the street and, I’m positive, savoring every minute of it. Everyone laughs. Many shake their head. That absurd Time Machine is impossible to miss. Bright silver-painted cardboard panels envelope the rickety little bicycle. It’s like the rocket ship dream of a child–with fins, and a whirling red police light mounted behind the bicycle seat, and flying streamers on the handlebars, and a galaxy of painted stars, and spelled out on the cardboard on both sides in big glittery letters: TIME MACHINE. Veering with abandon, good old Elvis steers his Time Machine up and down Main Street all the live-long day. Pedaling forward, moving through time. The church clock strikes the quarter hour. The sun moves higher above the horizon. A woman opens the window shades, breathes in and gazes across the land. Secret lovers behind the gas station kiss and part. A boy forgets his school books and sprints back home. A man remembers how his uncle burned the casserole the night before and laughs. A wrinkled hand wipes away sudden tears. Forward through time Elvis travels, his preposterous Time Machine shining brightly like a shooting star. Back and forth, up and down Main Street he pedals. Do me a favor... No, do yourself a favor, and pay him a visit. It's one you'll never regret. What are you thinking about when you write? Are you thinking about the story, or are you thinking about the writing? The answer to this question can have a profound effect on what winds up on the page. I think that, perforce, a pantser must be thinking at all times of the story. After all, she is making it up as she goes. The words flow, and the cleanup comes later, during an early edit, when spelling and punctuation are addressed with the story already complete. A plotter like myself has already done the creative work, and is now applying The Craft to that brilliant story he outlined. His thoughts, my thoughts, are on the nuances of phrase, the subtleties of degree, the interweaving of sometimes revealing, sometimes misleading dialogue. 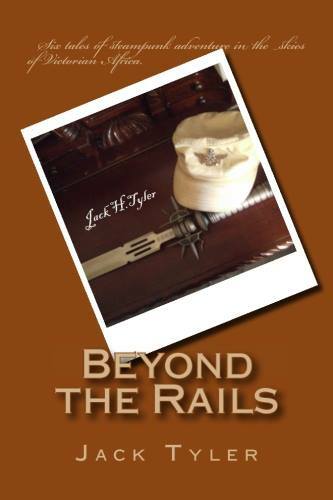 You will hear authors talk about how their characters force changes on their plans, and that is certainly true, but in my case, if Scene 86 has been plotted to be a showdown in the street, it is not going to somehow become a soul-searching conversation between the sheriff and the saloon girl with the heart of gold. Just doesn't happen. So, what does this lead to in the final product? Derivativism, plain and simple. 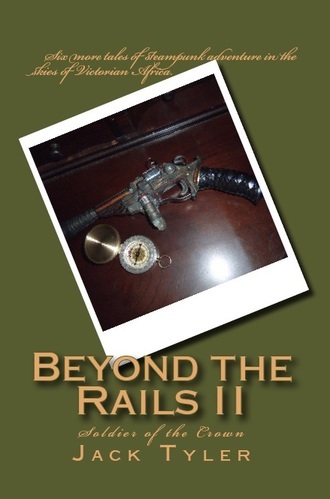 When Beyond the Rails hit the market, it wasn't long before one of the reviewers characterized it as "Jules Verne meets Firefly." Said reviewer swore that it wasn't meant in a derogatory way, and I love the description and use it myself, but it's gotten me to thinking: Have I ever done anything original? Before Temple of Exile, I started (and never finished) a series called Tribes of the Southern Sky. Can you say Star Trek, boys and girls? The focus of the story was Terran Space Agency Ship Chippewa, one of dozens of identical Frigates, basically destroyers, trying keep the peace in the Southern Drift, a helical swirl of fifty-odd stars projecting south of the galactic plane. The former enemy, the Vronn, had just signed an armistice ending a generation-long war, and an uneasy trust was developing between the two sides. The differences were the class of ship, smaller and not nearly as capable as the Enterprise, the size of the crew, about 20, and her redshirts were highly-trained professionals, sort of a meld of ninja and navy SEAL. Oh, and the captain was a woman. "Chops," the guy who eventually led me to steampunk, was reading it, and having seen this similarity, I remarked that I didn't want to become known as the guy who ripped off Star Trek. He was sharing it with a friend who suggested that I embrace it, write some Star Trek material and submit it to them, and perhaps they would approve me as a writer. I saw too many things wrong with that to list, but basically, it wasn't what I wanted, and I'm pretty sure it wasn't what they wanted either. I moved on to fantasy, starting with Temple of Exile, then moved on to modern action/adventure, and a crime drama. 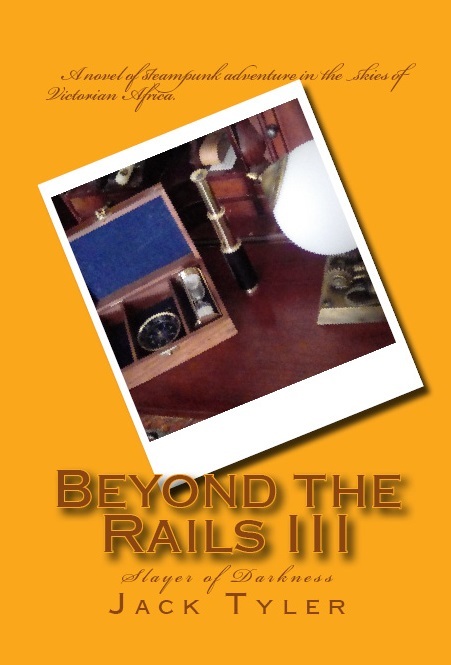 I can't say that I copied Lord of the Rings or Nero Wolfe (and you can't either! ), but that spark of originality, that intangible something that would deny comparison with something already well-known, was missing. Temple of Exile probably came closest, but as I wrote that without a plan, it was unpublishable from day one. I've mentioned the similarities between Beyond the Rails and Firefly, and the project that's really percolating right now is The Darklighters, which if I'm to be honest, is pretty much The Man from U.N.C.L.E. moved to a Victorian setting. I'm beginning to think that maybe I should just hang up the pen and enjoy my retirement. But it isn't that simple, is it. I'm pretty sure everyone in this audience knows that you don't choose to write, you are chosen, and once chosen, the only escape from that nagging muse is found in the act of writing. It doesn't matter whether you're good, whether you're popular, or whether you're published, once the harpy of literary creation sinks her talons in, you must write. I have two other projects under consideration that have the promise, at least, of some level of originality. Stingaree, named for San Diego's Victorian waterfront district, is to be a steampunk novel in which I will try my best not to emulate some other great work, and Nexus, which I think will come after Stingaree (the muse willing...), and will concern the activities of an organization defending the world from supernatural threats. Yeah, I know, Supernatural; but there's a lot of ground that can be explored under a theme like that, and I hope to find some that hasn't been claimed already. This is probably my best bet. All I can say is that I don't set out to copy other more famous works. I try to write the best story I can, and the things that creep into my work are the best examples I have. When you find them there, they are very much tributes, although I would like to eliminate them entirely, have my work be my own, and will work diligently toward that goal in the future. You, my readers, will have to tell me how I'm doing. How about you? What are you thinking about while you're writing, and how does it affect what goes on the page? It's something to consider, and there definitely is an effect whether you realize it or not, so put on your thinking caps, and see if your writing improves. There's a lot to be said for self-awareness! That's thirty for this week. Until next time, read well, and write better! It has been over six months since I posted to this blog, and that was to tell you to go somewhere else if you wanted to read my words of transcending wisdom and scintillating wit. Now I am returning to this page for various reasons, wider exposure, and the fact that this site is cited in my latest book as the place to visit me on line, but mostly because an old friend has just rediscovered me, and joined my followers here. I have missed her, and I would rather maintain an extra site than miss making contact with another friend, so over the next hours and days, I will be dusting off the furniture, cleaning the windows, and just generally refurbishing things to bring them into line with where I am now as a writer and a retiree with plenty of time to do this. Some, maybe most of the old posts will be going away, those that don't reflect my current philosophy, and of course, nobody wants to wade through all my griping and carping that found its way on here during those dark periods when my self-esteem was at a low ebb. All that will be left when the dust settles is positive, informative, uplifting posts that convey positive information about me, my writing, and my situation now. Initially, at least, the new material will consist of transcripts of my writing.com blog, Riding the Blimp, whose title comes from my steampunk sobriquet, "Blimprider." I post there every Monday, and the main subject is generally something to do with the Craft of writing. I will post one of those every few days until I'm caught up, and then repeat each new one here. That's all I'm looking at doing now, but when you're a writer, your mind is never still, so there's no telling what I'll be adding as new ideas come to me. The main thing is that it's difficult to get to me if you aren't a writing.com member, and if there's anything I don't want to do, it's be difficult to reach! Oh, and for the record, that old friend is professional book editor Lynda Dietz. You can read her well-edited and informative blog at http://www.easyreaderediting.com/. And now, I'd better get busy; this isn't going to reboot itself! UPDATE, 5:00 PM PDT: It took about six hours to screen the 76 entries I had posted on this blog since 2011, and in the end, almost all of them stayed. Some could have gone, but for the comments, which are the last reminders of friends from long ago. I my luck is good, they may find me again, and in any case, they are treasured keepsakes, like cracked and faded photos of friends gone by, cherished even as new ones are made. Well, hopefully, a lot more will be made here. Come on over, peruse the stack, and start a conversation. I don't bite (except by request! ), so you have nothing at all to lose but your reluctance. Let's talk!